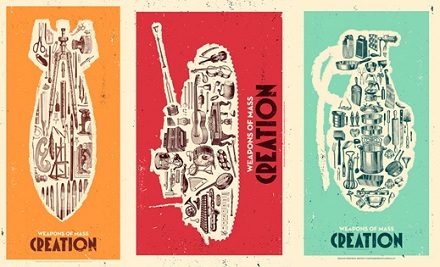 The ‘Weapons of Mass Creation’ series is a set of prints by Justin Kamerer of Angryblue that each feature items related to a subject which form the contents of a different weapon: ‘Music’, ‘Cooking’, and ‘Art’ are a tank, grenade, and bomb, respectively. The prints are available for individual sale or as a set, and are limited to 150 pieces each. They’re pretty damn cool looking regardless of any message the artist may or may not have been trying to convey.